is the biggest anxiety of such parents. 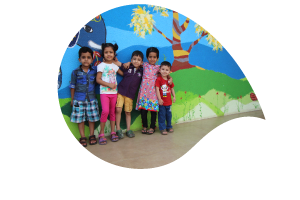 Understanding this, Pumpkin Patch, a leading organization in the field of early childhood care and education, has created an After School Care Programme. Our programme helps to keep children engaged in activities that help them develop academic and social skills in a safe and caring environment. Discovery learning satisfies natural human curiosity and promotes individual interests.It can occur whenever the children are not provided with an exact answer but rather the materials in order to find the answer themselves which improves problem solving skills. Activities for ASC children are designed on the concepts of Discovery Learning which encourages children to become active participants in the learning process by exploring concepts and answering questions through experience . The teacher acts as a facilitator to learning. Calm and cozy nap area with comfortable creche/bunk beds. Learning through age appropriate toys to enhance problem solving skills through activities like jigsaw puzzles, games, pretend play, etc. Participation in experiments for developing pre-science skills. A unique Maths lab to encourage fun with numbers. Planned monthly themes that provide a variety of daily focused experiences to develop social values like sharing, caring & helping through group activities like role play, dramatization & stories. Regular fitness activities help in appropriate body development of the school-goer and encourage him to adopt healthy habits that last a lifetime. Our experienced teachers work with children to develop their large motor skills like running, throwing, jumping, kicking etc. and practice co-ordination skills such as writing, drawing, cutting and other activities. In the vital time of their growth and enhancement, social and emotional development also plays a very important role. Children build a sense of community as they interact with each other through daily activities such as circle time games and songs. Planned activities Teachers work with the child to develop self-help skills and to bring out their true potential. Different planned activities like Dramatization, story telling, puppet show help to expressing emotions, inculcate good values and manners. Throughout his or her life a child will take in any new information through his senses. A child will learn through his five main pathways i.e. through what he sees, hears, and touches ,tastes and smells. The more we help him develop his five acute senses the more effectively he will develop the pathways on which his future learning will be based. From the very first day the brain parts are developed and slowly develop further. Taking advantage of this we provide many sensory experiences as possible because a child has a truly absorbent mind and it is important to strengthen the pathways that link both sides of the brain. Giving a child a solid foundation of language skills is a fantastic kick start for him or her. It is achieved largely by good interaction like speaking, reading books, nursery rhymes, competitions and games like Spelling Bee competition ,Tongue twisters and above all telling them what is happening and when it is happening. The brain stores information in groups of ideas and the more you link ideas the more a child will learn. Early exposure to fun science experiments develop a sense of curiosity and encourage the exploratory nature of young children. Games involving plastic animals, magnifying glasses, measuring cups, rocks, bug catchers, small toy greenhouses, shells, magnets, prisms, a compass, anything that involves the senses; sight, taste, smell, hearing, and touch, along with adventurous science items are introduced to the children to help them enjoy simple science.